Michael Franti’s music has taken on several different forms over the past 25 years: The singer/songwriter’s journey began in a somewhat primitive state, The Beatnigs, which Franti describes as “just beating on pieces of metal and shouting poetry over it.” The Beatnigs evolved into The Disposable Heroes of Hiphoprisy, which employed a more electronic approach, fusing a smattering of samples with drum machines. With the 1994 formation of Spearhead, the music graduated to live instrumentation. Through those iterations, the songwriting has always remained the one element that keeps a consistent path. Franti conveys those challenges throughout Soulrocker, the outfit’s ninth full-length record, which drops Tuesday, June 2. The elaborate tapestry of orchestral R&B, hip-hop interludes and ’90s reggae that fuels “Good to Be Alive Today” accompany Franti’s vocals, covering everything from ISIS and drone attacks to unemployment and gun control. The anthemic and atmospheric vibe of the album bookend “Love Will Find a Way,” written in response to the 2015 Paris attacks, radiates with Ladysmith Black Mambazo world chants. Franti opens a window into his personal life with the contemporary roots reggae jam “Once a Day,” inspired by the unbreakable bond his family has forged as a result of his son’s struggle with a rare chronic kidney disease. These tunes represent a small sample of Soulrocker and what to expect when Michael Franti and Spearhead make their second appearance at the California Roots Music and Arts Festival (8pm Sunday, Cali Roots Stage). 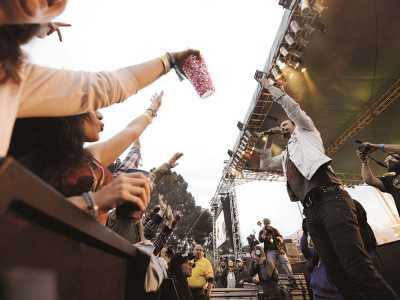 That is exactly what Cali Roots has become: Last year, over 30,000 people attended the three-day fest. In addition to reggae-rock favorites and Rasta luminaries that included Steel Pulse, Dirty Heads, SOJA, Slightly Stoopid and Iration, 2015 also boasted music outside the reggae-rock genre, including Philly hip-hop group The Roots, quirky hip-hop/blues of G-Love & Special Sauce and L.A. punk icons Fishbone. Aside from the Minnesota hip-hop duo Atmosphere (6pm Friday, The Bowl), this year’s 40-plus group lineup doesn’t veer much outside the reggae-rock scene. Along with Franti, other highlights include SoCal-rooted reggae-rock/hip-hop hybrid Slightly Stoopid (9:30pm Friday, The Bowl), reggae icon Barrington Levy (4:10pm Friday, Cali Roots Stage), Stephen Marley (6pm Saturday, The Bowl), Damian “JR GONG” Marley (9:30pm Saturday, The Bowl) and Cali Roots veterans Rebelution (9:30pm Sunday, The Bowl). Franti, meanwhile, jumps from talking about Soulrocker to the importance of voting in the upcoming election. Franti stands firmly against the negativit platforms in Donald Trump’s campaign. “My personal values and beliefs couldn’t be further from a candidate who would want to ban entire groups of people from entering our country,” he says. “Some friends have said if [Trump] is elected, they’re leaving the country. Some of the issues most important to Franti include economic opportunity for everyone, developing an easier path to citizenship and expanding our renewable energy portfolio.